I had the pleasure of attending a live taping of ABC’s The View for Simply Stacie not too long ago and it was simply a-maz-ing! Who would’ve ever thought I would end up sitting 2 rows away from the hosts that we all know so well! Less than 2-3 meters away from me sat Whoopi Goldberg, Joy Behar, Elisabeth Hasselbeck, Sherri Shepherd, and guest co-host, Kadee Strickland (Private Practice). The humor and personality these women brought to the discussion table were fierce, strong, and proud. I totally applaud that! 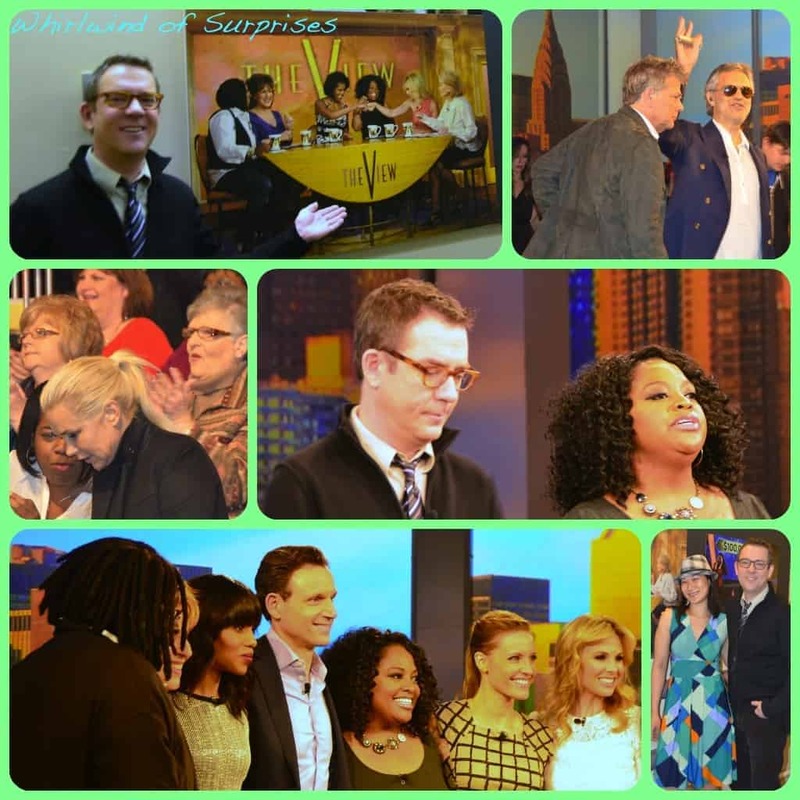 Treated to a variety of big name stars like Kerry Washington and Tony Goldwyn from Scandal, this episode of The View was packed. I was shocked at how fast the sets were changed up during the commercial breaks! Andrea Borcelli serenated us one of his new songs from his newly released CD, Passione. His producer, David Foster, played the accompaniment on the piano. This in itself was a bonus for fans of Real Housewives of Beverly Hills because with David Foster, comes his wife, Yolanda Hadid. My favorite though was the Unilever sponsored segment, wherein we watched and learned how to make healthier Jalepeno Corn Bread using “I can’t Believe it’s Not Butter” with Ted Allen and Sherri. Ted Allen, known as the host of Chopped, has created a variety of delicious lower calorie, lower fat recipes. 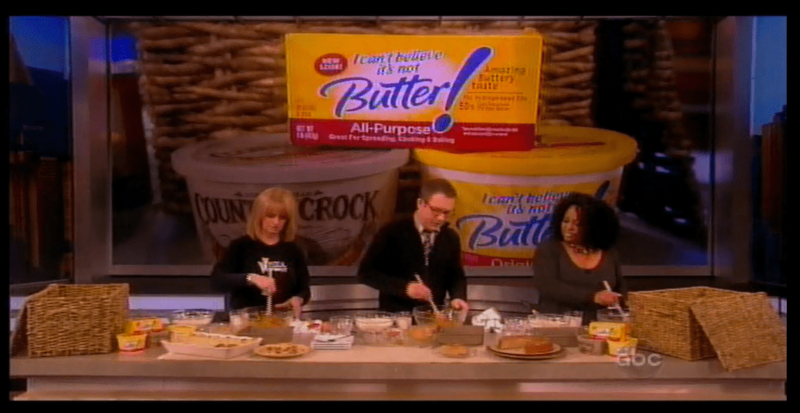 “I Can’t Believe it’s not Butter” and Country Crock has lower saturated fats, 0g tran fats, and 0mg cholesterol. So you can eat well and stay healthy. Watch this video for the demonstration. Doesn’t it seem like an easy recipe? For more low fat, low calorie, healthy recipes, you can visit It is Good to Know. They had also shown a premade Butternut Squash and Mushroom Lasagna, which I am dying to try out! After the show, we were guided backstage to await for Ted Allen so that we ask him a few questions. He told us that he likes mustard. Yes, mustard! And he liked to cook chicken because it’s a quick 5 minutes on each side. Too thick? Just hammer it down to half it’s size and cook for 5 minutes a side. Simple, right? The advantage he has when he has a cooking question is that he can always call up the Food Network chefs and ask for help. Pretty neat, huh? Can you imagine calling up Rachel Ray, Bobby Flay or Guy Fieri? Ted Allen was quite interesting to interview since I know there are a lot of “Chopped” fans out there. Seeing Ted utilize a healthier alternative to create recipes was inspiring especially for me because healthy eating is so important to our overall health. I hate sacrificing taste and well, we seem to have found a solution! Stay connected with I Can’t Believe It’s Not Butter on Facebook, and Twitter. Follow @CountryCrock. Based out of New York City and Canada, Cinny is the mommy to two furbabies. When not working full time, she enjoys working on her blog, Whirlwind of Surprises, spending time with family, travelling the world, playing with her pups, and living life as an adventure. Disclosure: I was not financially compensated for this post. I received a tickets to the show and travel arrangements. The opinions are my own, based on my personal experience. What a fun experience that must have been! That must have been such an exciting thing to be able to do! We love Chopped! How exciting! And healthy eating tips are always great. I love the pic of Cinny and Ted Allen. It was neat seeing the set up close. Just a tad jealous! I heart Ted Allen. How cool is that. I love Ted Allen! We’re huge Ted Allen fans. That must have been awesome seeing him put his amazing talents to work. Wow! You are so lucky! Bloggers get to do some really amazing things!!!! Love almost all of the people you got to see there!! How fun! The butternut squash and mushroom lasagna sounds delicious! 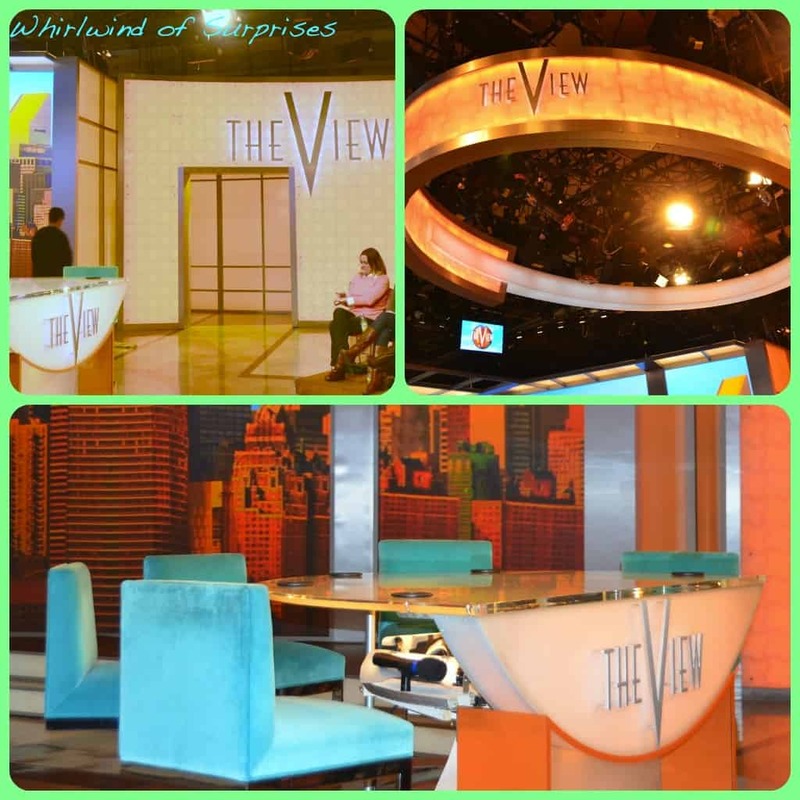 What a exciting experience to be there and watch the View and all the great guests. The jalepeno corn bread sounds delicious . Thanks for taking the time to tell us all about you fun day. Wow, Congrats! I bet this was a fun and exciting event, and for so many reasons. Jalepeno bread sounds delicious! I’m jealous you got to see the panel and the guests (especially one guest for me: Kerry Washington) in real life! Thanks for sharing your photos and experience! Sounds like you had a fabulous time.! Very exciting for you! Quite the experience. It sounds like you had a blast. I know I would have if I ever got the chance. It was fun reading about it. That is amazing that you got to attend this live taping. imagine being so near these stars! The butternut squash and mushroom lasagna sounds delicious! Very exciting!! I looove Woopi! And to be sitting so close to all of the hosts. Too cool. And I can only imagine being able to hear Andrea Borcelli sing live. Too cool,.